A man came into my workshop with his grandson and told his grandson how bad I was for leaving my plane stood upright on the bench. He told his grandson that the blade was “being damaged as we speak.” so to speak. I was obviously in earshot of his one-sided conversation and not wanting to correct him in front of his grandson I continued brushing on shellac to my picture frames. He started to take me to task further with his indirect comments even though his grandson could care less about anything beyond his two thumb digits tapping a rectangular glass screen held between his two palms. The granddad didn’t tell his grandson he was being rude by not listening to him and seemed to want to vent frustration out on the upright plane and the person on the other side of it who refused to take the bait. My frame looked nice and I placed it on the bench to dry. The man seemed more agitated but was it the plane, me, the two irritating thumbs or the youngster’s refusal to hear the opportune nuggets of wisdom the sage had or simply him not saying anything? Two days ago an Aussie came into the workshop and told me how he would have been in for a serious whipping if he’d left a plane upright on the bench. I thought to myself,”Wow, all the way in Melbourne kids were getting into the same hot water for not laying their planes down on their side.” I said, “Really.” I nodded. “Oh, yeah.” I tried to point out the flawed reasoning but to no avail. He was a cabinet maker and continued his strategy to convert me in case I “placed the plane on some sandpaper.” No point casting pearls before swine, whichever side of the bench you are on. Or of the world for that matter. Actually, this happens to me most days. Most of the people were told it as boys and had no relationship to woodworking beyond an hour or two a week in school. Occasionally one might have been the related to a woodworker and heard it from their relative and one or two were woodworkers themselves who adopted the pattern as a strategy for themselves. In fact I too was taught the practice in school, but when it came to my work as an apprentice that law went out the window and for good reason. I can’t remember in 53 years since I first used a plane ever putting it down on something and harming the cutting iron. I know it can and does happen. …If this plane is left on its side like this, is it protected well or even at all? It was mostly in schools that people laid the plane on its side because kids dumped the planes on top of chisels and squares and other tools/ That was a good working strategy to keep the irons from being damaged and most school benches were the flattop type with no wells, otherwise most craftsman-made workbenches were benches with wells running along the centre. Inside the well at each end of the 12’ bench was a swivelling square bar with a screw in the centre on which the plane could rest upright. We used thatat the end of the day when planes were stowed there for the night. It’s funny how things can get out of hand to become internationally ‘wrong’ through the years but often not for the right reason or indeed wrong for another reason. We can easily become legalists to the point that we can’t hear reason at all. If my teacher had told me to leave the plane upright but catty-corner in the well (had we had one) I would have obeyed. If he’d told me of the two good reasons I would have believed him. Now, in school here, there is no real woodworking but kids can program a CNC router to cut their dovetails. Problem solved! A letter on why no long planes? ‘ey up! Do I see a plough plane lying on it’s side? I’m grinning all over my face at this – thanks for brightening the day Paul. Yes, I think there is a greater moral to this little tale, but I would find it difficult to express exactly what that moral is. I was taught at school, exactly as you say, and have laid my planes down on their sides all my life as a result. Now, I don’t always, but every time I don’t there is a little twinge of guilt and a ghost walks over my grave, of Woody Woodward who took the woodworking class, three hours every week. I bless him for what he taught me, but he does haunt my bench to this day . . .
Our benches were about 7 feet long, and double sided with a well in the middle, and therefore shared with one of us at each side. 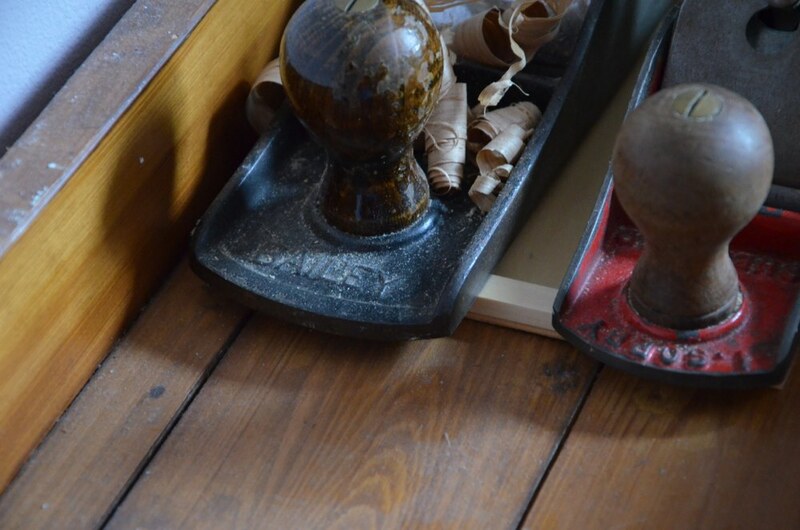 A mallet, square and marking gauge were kept in a rack at each end, and the planes and chisels had to be taken from racks in a cupboard which was locked between times. Sharpening was on an old electric sandstone wheel about three feet diameter with a drip can over the top and a trough underneath, and you got in trouble if the tap was left dripping or the trough allowed to get too full. Maybe your visitor didn’t like you ‘varnishing’ near the sawdust either? he filletster plane is lying on its side because it won’t stand up with a the fence fitted on the underside. I think wells are the neatest thing and really keep me from spending time moving stuff around to work. My chisels never roll to the floor and I feel in control at all times. You are so right Paul. That’s how I was taught at school, to leave the plane on its side presumably because clumsy little boys like me would ruin the blade. However the planes that we had were never properly sharp, presumably because there was never the time in the lessons to sharpen them up. I could never do what the teacher demonstrated because he kept his tools to himself and kept them sharp. I just came away, as most the rest of the class must have done, assuming I was incompetent. So much that we learnt at school needs to be un learnt. Isn’t that the truth. In the land of the blind the one-eyed man is king! I don’t blame the woodwork teacher. He had a job to do and limited time to do it in. It must be impossible to give school children decent tools when they are used for just an hour or so and then used by others in the next lesson. I notice that even you do not share your tools with your own students, Paul (insert smile icon here!). I have just been listening to Malcolm Gladwell on Desert Island Discs who considers that you need 10,000 hours to become expert in a subject I guess you have put in those hours paul, but very others have these days. My students have the same tools I use and they are equally as sharp and well set. We make certain of the in the first few hours and they get it in that time otherwise guess who will be sharpening their tools for them. And that is where what you do, Paul differs substantially form how were all taught in school. While there were many good teachers too many taught because they had to. You teach because you want to and so you think through for yourself what is the right way to do things. So you don’t teach the dictum ‘put your plane on the side’. You teach what is or should be just common sense – if only we all had it! David, how right you are. ! I too left woodwork classes feeling like a dolt because I couldn’t make a nice anything for exactly the same reasons. 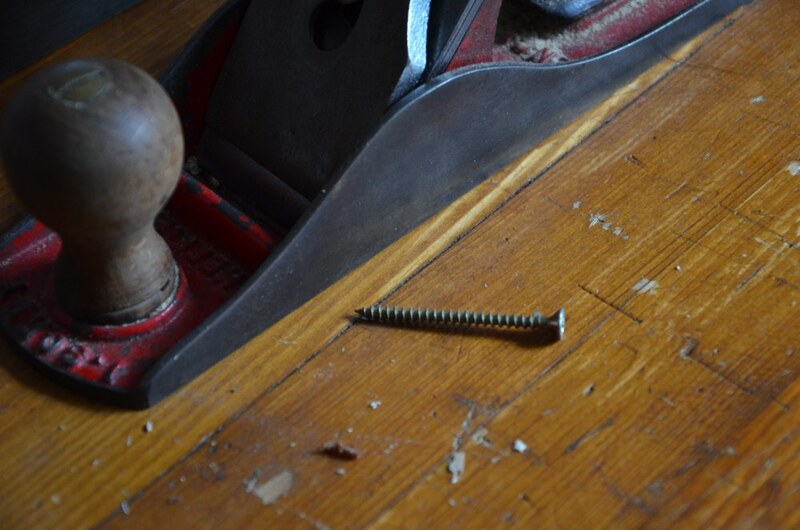 I realise now that nothing was sharp and the tools in general weren’t in that great a condition. It’s sad to know that many more of us came away from woodworking classes feeling the same way. However, I look across this morning at the block plane on the bench that has no well and lo and behold it’s lying on its side. My Stanley #4 and Dads Record 4 1/2 are sitting on a shelf with their heels resting on a stick. I mean I didn’t think about this at all, it’s just what I did because that was what was hammered into my thick head better than 40 years ago. It’s pretty amazing how well this stuff sticks with us regardless of whether or not there’s any merit in it. In the skeptic community we call this confirmation bias, and it is quite evident throughout many different areas of the human endeavor. It is always more comfortable to continue believing what we believe than to change regardless of the evidence presented, and the only way we deal with it is to demonize the person presenting an alternate viewpoint. In picture #2 above there is a wooden plan that looks like it’s been made using a chisel for the blade. Is this a ‘poor mans’ rebate plane or similar? It is. We used it in the picture frame videos we just completed and we are making a video on making it this week. 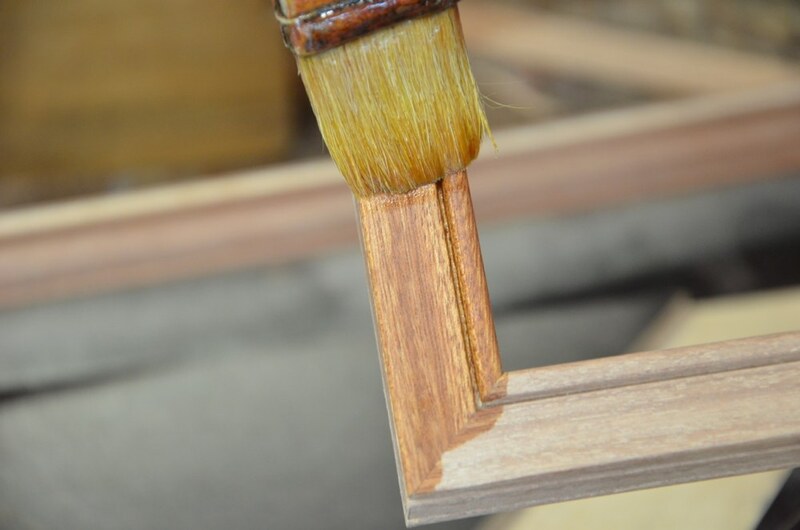 Will keep you posted as I have blog on the way on making picture frames for a business. I’d get graded down for leaving my plane upright on my workbench as well, but the only reason I’ve been given was that is ‘blunts the blade’ if you do that. I make sure I leave my plane the ‘proper’ way at work (no point goiving them more ammunition) and when I’m working on my own workbench I put it where I can reach it. I’ve long since learned that in the education system here there is a ‘right’ way to do things and everything else is ‘wrong’, regardless of the results. One day you will be set free from all of that and you can do as all craftsmen should do and that’s what feels right in their heart. It’s funny how many educationalists see themselves as the highest authority and have replaced the guilds that were craftsmen and women in their own well proven right as artisans. Not so today. he who passes the state exams is now the god of craft. How did we allow that to happen. So we can have staff that tick boxes on health and safety, absolve ourselves of personal responsibility and so on. This lowered the bar for me. I knew one apprentice who spent 1 day a week at college doing nothing but health and safety. He never touched a plane because he couldn’t pass the exam on safe handling of tools. How sorry is that?????? I’ve posted pictures of my workbench and people have ignored everything else and mentioned the plane sitting upright on the bench. Given that a plane blade is specifically designed to be forcibly pushed directly through wood grain hundreds or not thousands of times per day, it never made sense to me how placing the blade on a wooden bench to calmly sit still for a while could possibly do it any real harm. As for placing it on something that would harm it, you just need to pay attention for 2 seconds while you put it down, after which, you know it’s safe and sound and you don’t have to worry about it again until the next time you put it down. If you place it on its side, you have to be constantly diligent that the blade is lying there, waiting for you to brush up against it with your flesh or with a chisel, saw, or something else that’s going to damage it. It’s in constant danger rather than in danger for that 2 seconds you put it down. The only (only!) argument I can imagine in support for the view that placing it directly down will blunt it is that the iron is meant to take cutting pressure head-on, not from the bottom up. The pressure impacts different parts of the iron. If you sharpen Paul’s way you’d have to hit it on the bench pretty hard to turn that edge up (convex bevel is far stronger), but if you use micro bevels I can see it taking much less pressure to chip the edge off prematurely. I don’t know how much it would actually take, but that’s the thought I had. If I’m wrong, it’s probably my fault. Still, calmly setting it down won’t chip the edge with a micro bevel. You have to be fairly careless. Moot point for me, however, as I’m planning a bench with Shaker-style tool drawers, dog & holdfast holes, and…a well! At the college I attend we are also taught to lay our planes on their sides. From my personal experience I’ve found this to be more of a hazard than anything, I have caught myself on the cutting edge a few times when reaching for a nearby tool. I find that rather amusing given all the health and safety we are bombarded with. Thanks for all the videos and blog posts Paul. As a 17 year old learning joinery/carpentry these videos and posts have been invaluable, at my college we were never taught how to sharpen and set saws, but thanks to your videos I was able to restore my grandad’s old saws to their former glory (the same goes for a few tools). Ha! Not related to woodworking but we had a running joke in the military that there were three ways to do something. The right way, the wrong way, and the Marine Corps way. Guess which we did? Well I also put myself down as a dolt!…. maybe we could run a poll on this? At school our woodwork teacher was really an Technical Drawing teacher seconded as a woodwork teacher, says it all. After 40 years thanks to Paul I now know why my school project to make some speaker boxes became smaller and smaller and the sides were never flush. Too watch a craftsman at work is a joy. I see it as a form of open blade management – there is something sharp out there be aware of it. For chisels even more than planes. During my last woodworking course a follow student crossed his arms while listening to a presentation, pointing the 8mm chisel he was still holding towards my belly. We disagreed about the presence of the chisel and that 25cm between me and the chisel represents a safe distance, so I moved to the other side of the presentation. Naked blade routines are a necessity and at the same time they will create many formal discussions while preventing only occasional damage or accidents. To me, the greater crime is to walk into someone else’s shop, or creative space, and start telling them they’re ‘doing it wrong’, no matter what ‘it’ may be. I find the people who do tend not to be worth the time it takes to correct them. I’m an Aussie from Melbourne Australia. Hope you don’t think we’re all like that Paul. I haven’t bothered to lay my plane on its side for many years now but I do remember someone saying I should when I was younger and recently when I was doing a demo at the local club. I feel for you Paul. I couldn’t stand having people come into my workshop all day saying comments like that. Do they actually think it’s the first time you’ve heard it and that it’s their job to inform you. That would be so annoying. I think the moral of the story is people are annoying. I think it’s one of the reasons I love being in my workshop. NO PEOPLE! All my work is posted out. Don’t get me started on the silly email questions I have to put up with though. Mate I couldn’t stand that. I have no patience for idiots. By the way I just restored and started using my moving filister. Great little Dutch plane I found and yes I know what you mean about them not standing up. It kinda annoys me having to lay it on its side actually because I’m paranoid I’ll brush my knuckles on it reaching for something. I can’t stand having planes on their sides it just doesn’t seem right to me now. I must stir the ranks and say that laying a plane on it’s side does have some merits, when I am working on a job and the only place to set anything down is an unkind surface. Unfortunately the level of control at a worksite is often minimal so the prevalence of abrasive rubbish on most surfaces and lack of workbench space will dictate methods that I do not bother with or require when in my own environment. Damage done to my worksite tools (fortunately none permanent) through poor placement on saw horses (waiting to be knocked off, by others and from myself) or contaminated surfaces alter the methodology of use. Suffice to say, when it comes to damage to a cutting edge, hidden or missed fixings have been the number one bugbear along with embedded sand (we have it everywhere). That, and the occasional unexpected rainshower to add that lovely light rusty patina we are all so fond of to any wayward tools when in an exposed environment. I had a look at my bench briefly when I got home, there were four planes sitting on it, all upright with a range of other bits and bobs (my current workspace is very small so clutter is rife). None were sitting on anything other than the bench surface and the actual surface was quite clean, aside from a small amount of sawdust and shavings. I fail to see the issue of them being upright, especially as the practice of laying planes on their sides was also drummed in at school and they were certainly unable to take a shaving anywhere near the ease with which mine now do. In fact, the only tool I can recall that we had with any degree of sharpness was the occasional bench chisel and it was a rudimentary edge at best, as was I at the time. Great input and having worked on sites I know that here is a point in case where setting the plane upright in grit and so on would be very counterproductive. Thanks for this. Loved it, well explained and clearly valid. I love things that are not mere opinions. My cousin is a carver and grew up in a furniture shop that did fine work. He saw a photo of my bench in use and said he’d have been scolded for putting the plane down as I did. That would have been back in the 60’s and the scolding would have been from men trained in the 20’s and 30’s, I guess? So, it’s a wide spread belief. If you’re from one of the schools that treat the bench top as a surface to be kept pristine, I can see not wanting to put the plane blade down. I’m glad I’m not from that type of school. 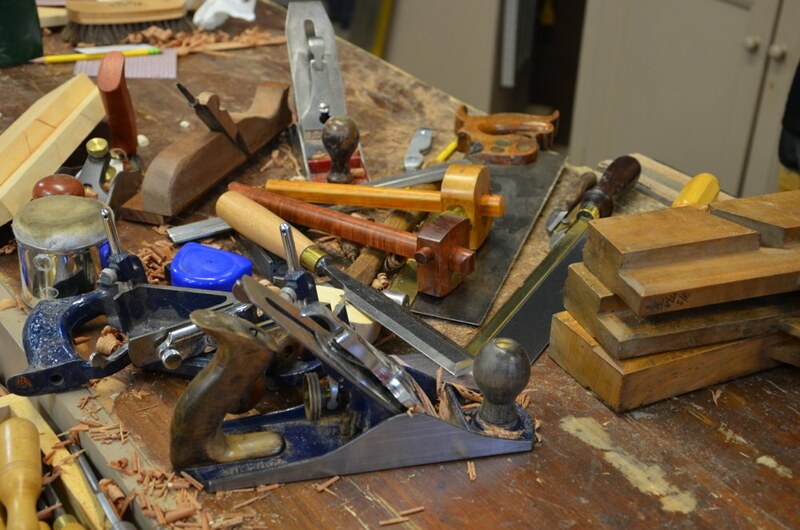 Great article Paul, I’ve never put my planes down on the side because of the danger of glancing cuts when reaching for other tools on the bench, which was mentioned in a previous comment. Also I’m in the habit of retracting the blade most of the time when it’s not being used to protect the cutting edge in rough working environments. Thanks again for an interesting blog regarding this outdated school classroom practice which isn’t practical when considered in a proper working environment. Interesting post, I was one of the lucky one’s to have a “stickler” for a teacher back in HS shop class. The 1st thing he taught us beside’s shop safety of course was learn how to sharpen edge tools at the beginning and to make sure we sharpened / honed tools at the beginning of our classes. He also suggested laying planes on it’s side mainly because there could be something on the bench to nick the blade but it wasn’t a must. We didn’t have tool well’s as our bench’s were approximately 5′ X 5′ with a vise on each corner and locker space below. So I never got in the habit of laying my plane or planes on the side, personally I was more afraid of nicking my fingers with the blade being exposed. Mine lay aside.No because I think it’s any better but when I started working, if you forgot to put your plane aside, there was a good chance that one of your colleague dig your blade in one blow deep in the workbench or, worse, in your current job. So funny. Today, if I lay it upright, I usualy have a glance over my shoulder to be sure nobody can see me. I do sympathise with Paul being in such a public place the know-it alls he has to put up with on occasions!! A dream day out for me would be to meet Paul spending the day drinking tea, walking the area, seeing the projects in hand and generally sharing some time with a great master. Maybe one day, Criticise him certainly not some never get it! I remember my first woodwork lesson at the age of 11 in 1961. Our teacher mr Clarke, told us that murder and mayhem would ensue, if we left our planes upright. It is a habit that I do automatically even now. I’m not saying that it is right, it’s just what I’m used to. 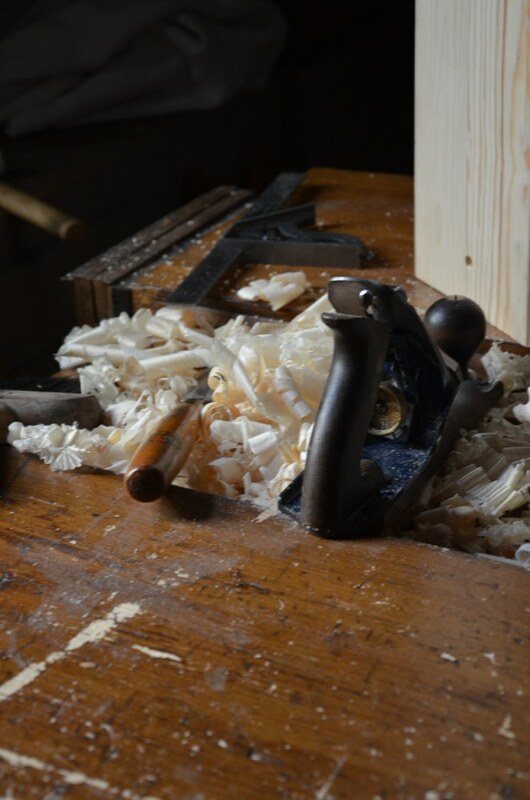 The one thing that Clarky instilled in all of us, was a love of wood work. He had huge hands like catchers mitts, and used to strop the wicked sharp plane irons on the palm of his left hand. We would watch fascinated, waiting (hoping) for some blood to appear. There was never any though. God bless you mr Clark, wherever you are……. As many others I was trained to leave the plane on it side. Over many years I have never hurt myself or damaged a plane blade leaving it that way. That said I see little or no reason whys plane left upright would be damaged either, in most workshop settings. As Paul mentioned above in one reply it seems like both ways are reasonable. What one feels most comfortable with is probably the best solution in this case. I too was taught to lay my planes on their sides, and even though the reasons mentioned are all reasonable, an even older reason may come to mind if you use old wooden planes that have no mechanical adjustments. 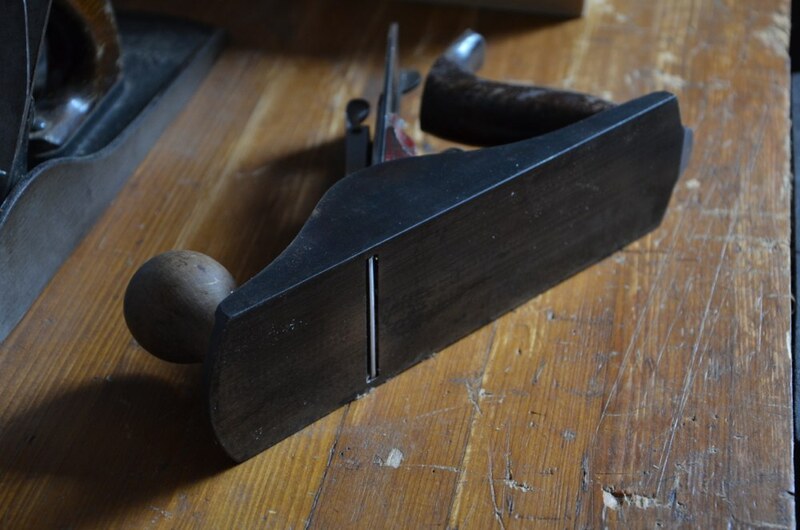 The genesis of this practice could have come from the idea that if you place a wooden plane on it’s sole you could knock the iron out of alignment, and it merely snowballed from there. Although my wooden planes seem to go out of alignment if I just look at them, if I set one of them down less than gingerly, it becomes unusable until I reset it with a tap hammer (all the while contemplating using the sledge). I don’t really think that this would be the case. If you look at older images of planes and indeed old and ancient drawings, the planes are almost always upright on the benches. It may be that your plane or planes are not tightly wedged enough I don’t know. Every wooden plane I have ever used I have found the irons rock solid and more often take some shifting to make a change in set or sharpen up. It may seem irrelevant (or maybe irreverent), but Paul, your comments on never logically questioning what is fed to us when we are children brought to mind a vivid picture of me sitting in Sunday School listening to the ‘marm’ teaching us what the bible says to do without ever any of us actually opening to one single page in the bible!!! I now have read the bible through several times and have found it nearly impossible to find a clergyman who teaches what’s really in it. Common sense to me is never being satisfied with what you’re told, but investigating matters for yourself… And never so smart that you can’t entertain a new thought or stop altogether searching for the truth of a matter. I like the fact that you have real concrete reasons for the way you do things, which always leaves us thinking things over, since thinking itself has almost become extinct. Any book including something like the bible remains dead work until it becomes a lived life and so I retain the right to live a life full of promise and following a vocational calling as a lifestyle woodworker encouraging others to cross over to the other side and live real life. My grandfather always taught me that to never leave a blade showing on a workbench, because, when trying to grab something near it, you could harm yourself. So when I first bought a plane, it didn’t even get to me that I should put it on the side (maybe because it was a wooden plane, and that was not practical). Now that I have a N°4 stanley (which is a delight, but I still got some issue setting it properly), I also don’t put it on the side. I heard people saying it should be on the side when putting it aside, but that never really appealed to me. Now that I read you billet, I can understand why people where saying that, but also that I wasn’t it the wrong. Well, I don’t know how much of this is about planes and how much about life?! I was taught the same thing in school, and started leaving my planes upright as an adult because the planes can and do get bumped and then out of adjustment. Of course I am usually the only one in the shop so do not worry about others getting at the tools. Our school tools were so horribly dull it turned me off woodworking for years so that was not the reason this was taught. I think a lot of life is overheard phrases that we take as wisdom because we know no better, not having the experience enough to see through the falsehoods for what they are. I have spent decades wading through and testing a lot of these ‘set in stone’ rules … most turn out to be based not on fact but the continuous repitition of others who know no better either. I am always surprised to prove to myself how much of these golden rules turn out to be malarchy!! If it works it works, if not I discard it and try to make a mental note to give up that practice. Besides, at this stage in the game if I were to set my plane on something that dinged the iron I know I will be the guy to spend the proper amount of time repairing that edge, so the thought makes me careful to look before setting the planes and almost all the tools down on my bench! Cheers and thanks for sharing this, was a good one as usual. Paul whats your opinion on placing cork lining for cabinets for storing handplanes (upright of course!!!haha). 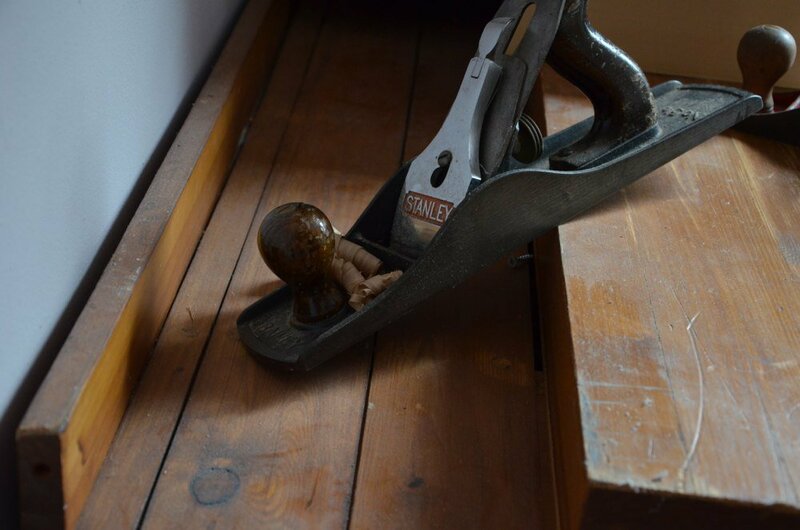 Does the cork harm the handplane in anyway (e.g. scratch it?) Also is there any possibily for the cork to keep moisture and damage the handplane? Also I see from time to time you mentioned that black rubbery lining (was it for the drawer of the wall hung cabinet project? i dont remember exactly). With your experience have you seen that the black rubbery thingy damages the handplanes in anyway overtime? Do you think the cork works better? or do you recommend something completely different?